BATAVIA, N.Y. -- Last month, Genesee Community College officials marked the end of a multi-year 50th Anniversary celebration by sealing a special Time Capsule inside the stairwell at the south end of the new Richard C. Call Arena. The treasure trunk is filled to the brim with over 200 items of College memorabilia collected over the past 18 months to document, preserve and celebrate the College's first 50 years. The Time Capsule is scheduled to be opened in May of 2068 as part of GCC's 100th Anniversary Celebration. 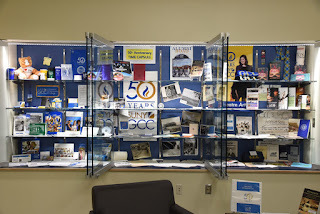 "Sealing up and stowing away our Time Capsule offers the perfect opportunity to draw our eighteen month 50th Anniversary celebration to a close," Dr. James M. Sunser, president of GCC said. "It tied together our inspirational past and our dynamic present, and all within a new facility offering immense promise for GCC's future. If there is a better conclusion to the whirlwind of anniversary celebrations and activities this past year, I can't think of it." Alumni - Six "Forum" newsletters, alumni buttons and the 1993 book, "Profiles in Success: Reflections of the Graduates of GCC"
A few historical highlights: GCC is one of the few colleges nationwide that was established as a result of a successful grassroots campaign that culminated in a successful 1966 public referendum supporting the creation of a community college. Genesee Community College first opened its doors on September 28, 1967 with 21 faculty members and 378 full-time and 243 part-time students-which was five times more than anticipated. In addition, alumnus Donald Conway, GCC Class of 1979, who worked on a major NASA project during his employment at Kodak, shared some of the collateral materials from the CHANDRA X-Ray telescope. Conway attended the Time Capsule ceremony and helped President Sunser stow the large trunk-size capsule. GCC's first campus was on West Main in Batavia in a converted Valu Hardware Store. The College enrollment quickly outgrew this space and its permanent home opened in 1972 on College Road. Other innovations and openings include: the introduction of online "telecourses" in 1987; the Albion Campus Center opened in 1990; the Stuart Steiner Theatre was added onto the main campus in 1991 and the Warsaw Campus Center also opened in 1991 (moving to its current YMCA building in 2002); the Lakeville Campus Center opened in 1992 which became the Lima Campus Center in 2009; the Arcade Campus Center opened in 1995 which expanded in 2001; the Conable Technology Building was built in 2000; the Dansville Campus Center opened in 2002, which relocated in 2012; the Wolcott J. Humphrey III Student Union opened in 2006; the Dr. Bruce A. Holm Upstate MedTech Centre housing GCC's Nursing Department opened in 2010; the Rosalie "Roz" Steiner Art Gallery was built in 2011; and finally the Student Success Center and Richard C. Call Arena in were built last year in 2017.